Save the date for our ever-popular annual Tack Sale during HorseFest at the Lake Metroparks Farmpark. 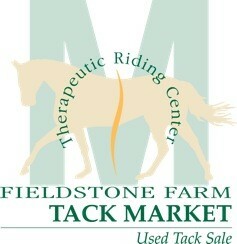 Gently used saddles, boots, bridles and more will be on sale, all to benefit Fieldstone Farm. We are grateful to all who have donated their equipment. It is a wonderful way to stock up on some needed items while helping to support our programs. To see our latest flyer, please click here.